Cooking with a farm share delivery means that you cook what is in season. Sometimes I feel like if I have to eat one more beet I just might… well use your imagination… Toward the end of the summer we started getting a TON of cucumbers and zucchini. At first, I was so excited to make zucchini bread and cucumber infused gin and tonics. When I’d had my fill of those (didn’t take long), these little guys started to linger in the crisper drawer until they withered and aged and finally made the inevitable journey to veggie heaven, aka the compost bin. This ALWAYS makes me feel guilty- they didn’t even get a chance to be great! Farm shares should not induce guilt. Please excuse the terrible quality of this picture- it was taken with my cell phone. Miraculously I had all of these items in my house. 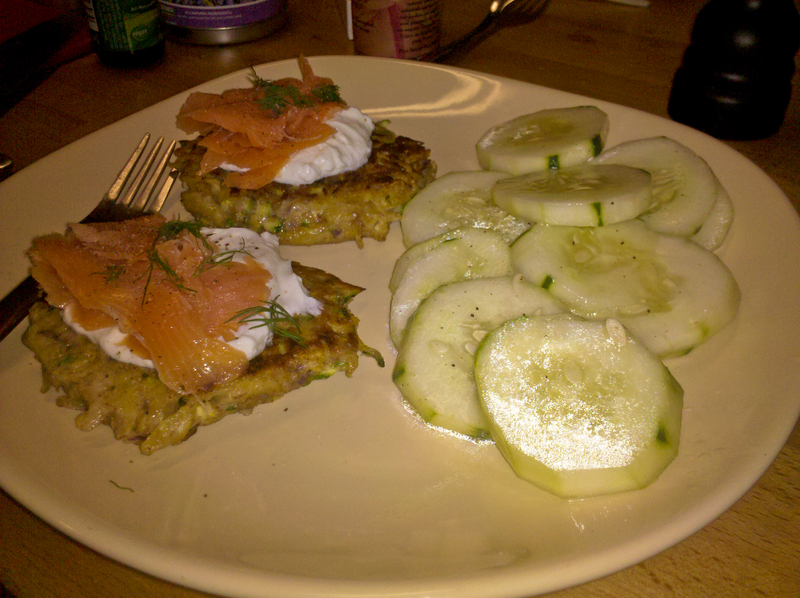 To make the fritters, simply grate equal measures of potato and zucchini. Squeeze a bit of the moisture out when you finish grating. Add an egg or two and a few tablespoons of flour to bind. Season with sea salt, freshly ground pepper and onion powder. Or if you prefer to grate fresh onion, be my guest. I don’t like to torture myself or cry in my food. Mix all ingredients together. Heat up a few tablespoons of oil ( I like grapeseed) on medium heat in a large frying pan. Form little flat fritters (about 1″ thick) and cook until deep brown on both sides. Then top with a dollop of greek yogurt, sour cream, creme fraiche or whatever you prefer that’s creamy- even a schmear of cream cheese would work. Top with wild-caught smoked salmon and a few sprigs of fresh dill. Dust with a bit more salt and pepper and there you have it. Not bad, huh? The cucumber salad is just sliced cukes with salt, pepper, extra virgin olive oil and a few dashes of white wine vinegar. This meal was great for an end of the summer dinner and still delicious for lunch the next day. Plus, no veggies were left to wither and die- my crisper drawer was empty and ready for the next delivery! Drink Some Booze, You Boozin’ Boozer. Everything but the Kitchen Sink: FRITTATAS!